The three schools associated with the Carapook area were No. 915 Bruk Bruk situated two miles north of Carapook village and which appears to have commenced operating around 1865, followed by a temporary school No. 1624 Carapook, situated in leased premises two miles south east of Carapook village and opened on 21 Sep 1875 and the permanent school situated within the village of Carapook and known as No. 1969 Carapook which opened on 9 Oct 1877. This school was established as a vested common school in the Coleraine area, opening in a temporary building erected on a reserved site on 1st of July 1867. HT Wm. McBEAN held the position until 30th of April 1868. During the first year of operation the school had an a.a. of 26 (18 boys, 8 girls). The school became a Stae School in 1873 and finally closed on 8th of October 1877. Source: "Vision & Realisation", Vol 2, Education Department of Victoria. The Bruk Bruk School continued operating until 9 Oct 1877 when the new Carapook School opened. The last teacher was Caleb RADFORD who became the Head Teacher of the new school known as No. 1969 Carapook. Jessie J. DAVEY was the first HT of this school which opened on 21st of September 1875, School was held first in a rented building but a site was obtained on private ground in 1875 and next year a new school and quarters were built. In 1877 the a.a. was 16 (6 boys, 10 girls). This school was closed on 23rd of November 1877. A new school 1969 Carrapook was opened on 9th October 1877 by HT Caleb H. RADFORD. This school incorporated 1624 Carrapook and 915 Bruk Bruk which opened on 1st of July 1867 and closed on 8th of October 1877. Caleb H. RADFORD was HT of this school from 1872 until it closed. He remained at the new school (1969 Carrapook) until 1883. Carapook appears to have come from the Aboriginal word for hilly country. When the local residents petitioned for a Carapook school in 1875 a local resident John Stock, on 7 Apr 1875 offered to lease to the Education Department a brick cottage for school use at three pounds per annum. The Board decided to accept this offer pending a decision on the construction of a new school and School No 1624 Carapook eventually opened in the leased cottage on 21 Sep 1875 with Jessie J. Davey as Head Teacher and instruction commenced on 18 Oct 1875. This school was located 2 miles SSE of the village of Carapook and remained opened until until 23 Nov 1877. The average attendance during 1877 had been 16 pupils. 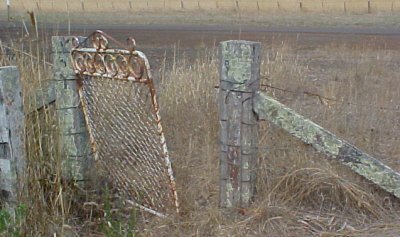 One of the few recognisable features of SS No.1969 Carapook is the front gate shown in this 2002 photograph. The District Inspector on 18 Sep 1875 recommended that the site described as allotment 17 Parish of Carapook be immediately reserved for a school site. The Department on 9 Oct 1875 applied to the Department of Lands and Survey for the reservation of this site which was gazetted on 3 Mar 1876. On 15 Sep 1876 Kohn and Campbell tendered to erect a school-house and 3 roomed quarters for sum of 525 pounds. William H. Boyle on 16 Sep 1876 tendered to erect the premises for 500 pounds. I.L. Forrester on 29 Nov 1876 tendered to erect the school for the sum of 490 pounds. The tender was accepted. The District Inspector on 2 Nov 1876 suggested that the proposed new school could replace both existing schools Carapook 1624 and Bruk Bruk 915. 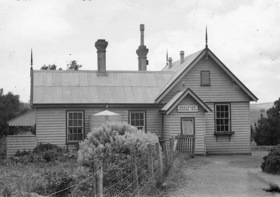 The new school was eventaually completed on 21 Mar 1877, but not occupied until a final decision was made about Carapook School 1624 currently operating in leased premises. On 1 Sep 1877 the Deaprtment decided to transfer the school from the leased premises to the newly erected school-house when furniture and requisites had been supplied. The new school named S.S. Carapook No. 1969 and incorporating both S.S. 915 Bruk Bruk and 1624 Carapook was opened on 9 Oct 1877 by Head Teacher Caleb H. Radford, (the former Head Teacher of S.S. 915 Bruk Bruk). Appreciation is expressed for the information provided by the History Section of the Education Department of Victoria as the basis for this article. Carapook Schools & Teachers from "Vision & Realisation"
Carapook, meaning 'hilly country' was named by the Aborigines. In 1837 the Henty Brothers took up the land around Coleraine, Casterton, Sandford, Merino and Runnymede. In the 1860s, when land was made available for selection, a consequent influx of families occurred. Perceiving the children's need, Elliot commenced a school on part of a property called 'Burnbank'. Children paid a shilling each, per day, to attend. Several years later, local residents built a permanent school building out of stone, and a residence on the same property. Known as Bruk Bruk School No 915, this commenced in 1867. The first HT William M. McBean stayed for ten months. In 1872 Caleb H. Radford became HT Then in 1877 Radford transferred with the school to a new stone building and residence in the Carapook village. This new school was known as Carapook SS 1969. Being on the present school site it is 3 miles SW of 'Burnbank'. Radford remained until 1883. During this time young women, and even young men with beards, attended the school. Up to this time attendances at the school had been in the vicinity of 40-50. In 1959 a new building was erected and opened in 1960.
came to the school. Then in 1964-5 a telephone was installed and electric power connected.